On the first day of the program, students will meet the director, program assistant, and housing coordinator at Dorsoduro 909/B for Program Check-in to pick up vaporetto passes, apartment map, and apartment cellphone. A landlord, rental agent, or roommate will then bring you to your apartment, where you will get your keys. Detailed directions to our rendezvous location at 909/B Dorsoduro, which is located on the eastern side of Campo di San Agnese near the Accademia and Zattere stops, will be sent to you in May as part of your arrival letter; please also consult the information below. The main airport is Venice–Marco Polo Airport (VCE), north of Venice proper, on the mainland at the edge of the lagoon. The secondary airport is Treviso–Antonio Canova Airport (TSF). You can reach the city either by water or by land. The entry to the city from the mainland is at Piazzale Roma, the bus station. The blue ATVO direct shuttle-bus, which departs every 30 minutes between 5:20 am and 1:20 am, costing 8€ one-way, with a travel time of ca. 20 minutes. Bus schedules are available online. The orange ACTV Bus #5, which is cheaper and runs every 15 minutes, but is slower (since it makes multiple stops along the route); bus schedules for ACTV #5 are available online. Obtain bus tickets beforehand at the ticket office (biglietteria) directly outside of the Arrivals hall at the airport; the staff speak English. Remember to validate your ticket by stamping it in the box before you get on board. From Treviso Airport, there is an ATVO shuttle-bus that travels to Piazzale Roma in Venice. It departs approximately every hour (ca. 10€ one-way, travel time 70 minutes). Bus schedules are available online. 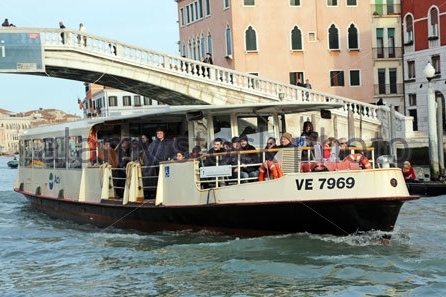 Other than walking, the way to get around in Venice is by water bus (vaporetto). The agency that oversees the vaporetti is ACTV. All land vehicles end at Piazzale Roma in Venice; from here on there are no more drivable streets. The Piazzale Roma vaporetto stop is next to the Ponte della Costituzione (the glass Constitution Bridge, designed by Santiago Calatrava). To reach our orientation meeting point at Dorsoduro 909/B from Piazzale Roma, take either vaporetto no. 1 or no. 2 to the Accademia stop, or no. 2 to the Zattere stop. Purchase tickets before boarding (one way 7.50€, valid for 75 minutes). System maps and live timetables are posted at each stop. You may also take a direct boat from the airport instead of the bus. 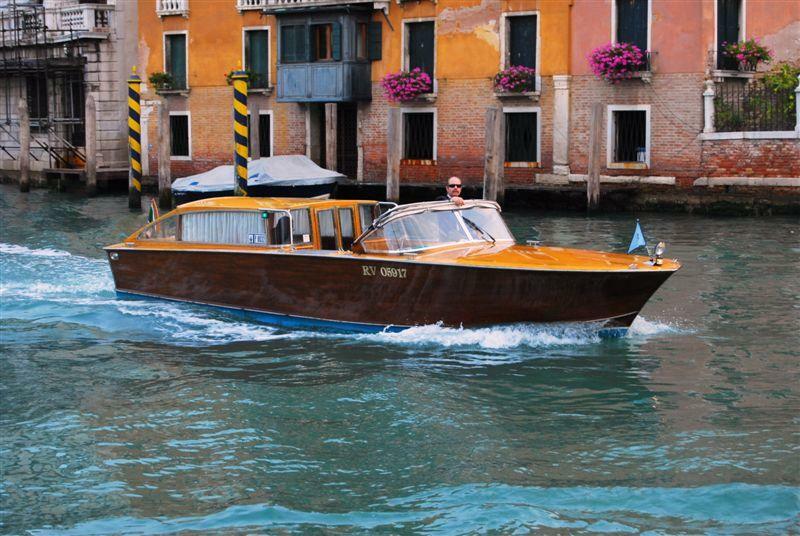 Take an Alilaguna boat from Marco Polo airport to the Zattere stop in Venice (15 € one-way, travel time ca. 90 minutes). The Linea Blu will take you from the airport to Zattere, which is the closest boat stop to our meeting place; this boat departs every 30 minutes, on the hour and half hour. Schedules and information are available online. By water taxi: If there are several students traveling together, you can take a water taxi (motoscafo), which can bring you to the Zattere stop. However, water taxis are not recommended if you are alone, as they are very expensive (107€ or more). Although not necessary, water taxis can be booked in advance online. When you arrive at Venezia–Santa Lucia (NOT Venezia Mestre!) on a Trenitalia train, walk out from the doors and take vaporetto no. 1 or no. 2 to Accademia or no. 2 to Zattere. There will be a brief orientation meeting and pizza supper the first evening, and an orientation walk the following morning. Venice can be a very confusing place; purchasing a detailed map upon arrival is highly recommended. Rough Guide maps, for example, are highly detailed and durable, and thus are a good investment. You will be shown how to get to the studios, classrooms, banks, and materials shops. If you get confused, don’t worry; you’ll be amazed at how you will be able to get around in a few days. Also, remember that Venice is a rather safe place, so you need not fear walking into a bad neighborhood; as always in a city, keep an eye on your wallet.